In 2018 sales are expected to be affected by slower household spending growth, triggered by a weaker housing market and subdued growth in household income. 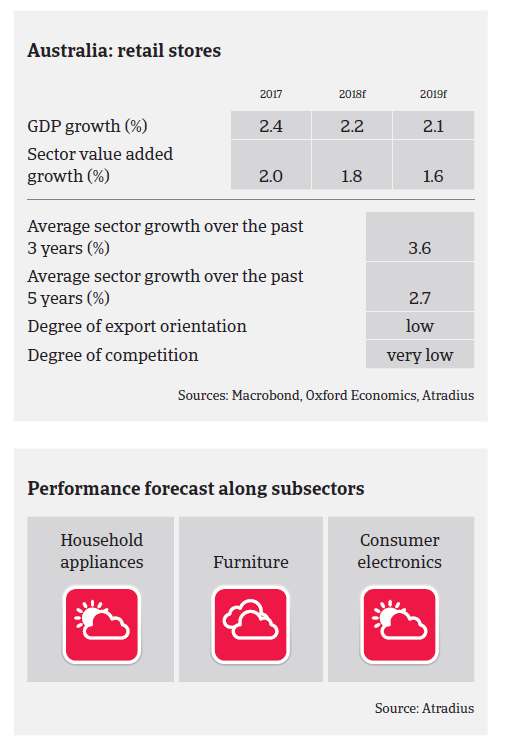 In 2018 consumer durables retail sales are expected to be affected by slower household spending growth, triggered by a weaker housing market and subdued growth in household income. Growth is mainly generated in the online retail segment, driven by high internet penetration in combination with a well-established online banking system and a well-developed logistic infrastructure. The transition away from high street sales towards online sales has been very swift over the last couple of years. In 2017 the margins of traditional brick-and-mortar retailers have been negatively impacted by the shift towards e-commerce and this trend is set to continue in 2018. Well established players have meanwhile revised their business strategy in response to this shift and managed to sustain their market presence by generating more sales online. However, for smaller retailers it is increasingly difficult to compete (particularly on price and convenience), and therefore more store closures and businesses downsizing are expected in the future. Payment terms in the retail sector vary between 30 days and 120 days. In general the payment experience in this industry is good, and no major increases in payment delays or insolvencies are expected in 2018. The financing conditions for the industry remain generally positive, with the majority of loans sanctioned for working capital management and with no major breach of covenants. Given the fundamental shift in the retail industry towards online sales and digitalisation we have adopted a cautious approach when assessing businesses with traditional (offline) sales channels. Therefore, besides focusing on the financial situation of buyers we also assess management ability to adapt to the changes within the industry.